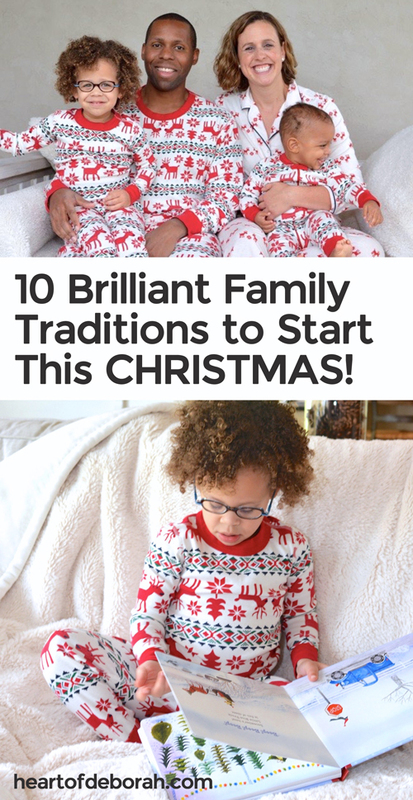 10 Fun Family Christmas Traditions to Start This Year! Thank you Hanna Andersson for sponsoring this cheerful conversation! It’s true, Christmas is the most wonderful time of the year. Yes, I’m one of those people who starts playing Christmas music the second Halloween is over! Now that we have two children we’ve started thinking more about family Christmas traditions. I didn’t realize how many traditions we had growing up until I got married and learned about the different ways my husband celebrated Christmas. It’s been so much fun creating our own family traditions together. 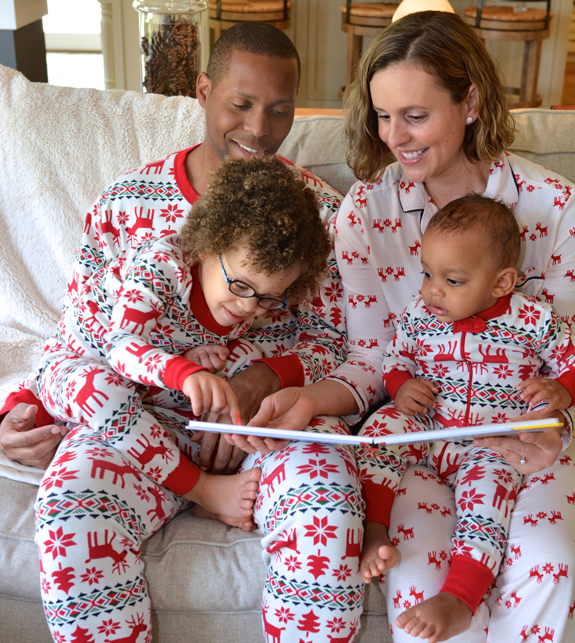 Do you have a special book or activities you do with your family around the holidays? I hope this list of 10 fun family Christmas traditions inspires you and brings some cheer to your holiday season. One of my favorite things to do around the holidays is sing Christmas carols. 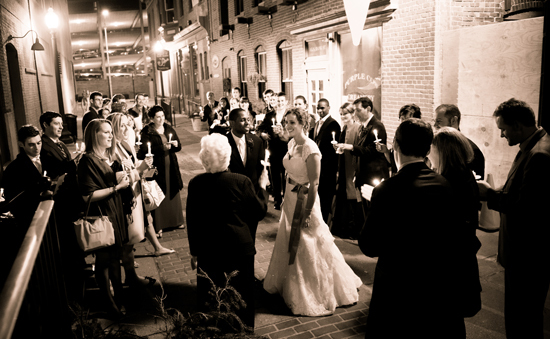 We were married in December and at the end of our reception we gave everyone candles to hold. The guests sent us off singing to the tune of Joy to the World. It was amazing and I love the idea of lighting candles each year and singing carols with our family. Need to stay warm and get in the Christmas spirit? Create a hot chocolate bar on either Christmas Eve or Christmas Day. Warm up your house and your tummies with a delicious hot chocolate recipe. Add fun toppings like marshmallows, whipped cream and chocolate drizzle! 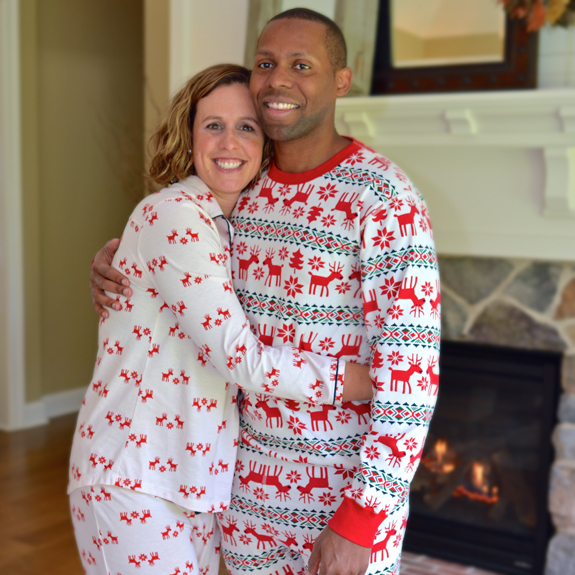 My roommate in grad school told me her family gifted each other Christmas pajamas every Christmas Eve. I immediately fell in love with the idea and as soon as we got married we made this a new Gaines family tradition. Now that we have kids it’s even more fun! I haven’t decided if we are going to gift the pajamas December 1st or wait until Christmas Eve. Either way, it’s such a fun and sweet way to get into the spirit of Christmas. 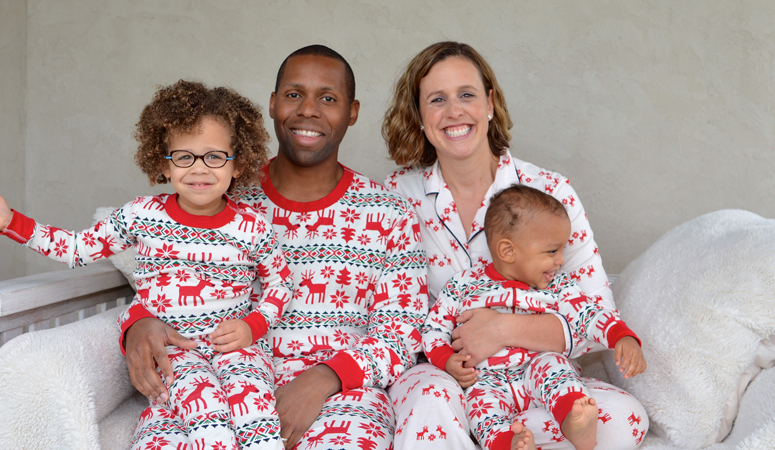 The last few years we’ve worn Hanna Andersson’s family pajamas . In my opinion, they have the best patterns and their organic cotton is so cozy! Look how much our family has grown since 2014. Every Christmas Eve we read the nativity story found in Luke chapter 2. Sure candy canes, gingerbread houses and Christmas trees are amazing, but we also want our children to understand why we celebrate this holiday, the birth of our Savior! When we dated my husband took me on a date to look at Christmas lights. He said he often did this with his family growing up. Last year our daughter always wanted to find “MORE LIGHTS” when we were driving in the car. I can’t wait to hear her reaction this year as she sees the Christmas lights come out. Another great idea is to sing carols in the car while you drive around looking at lights. 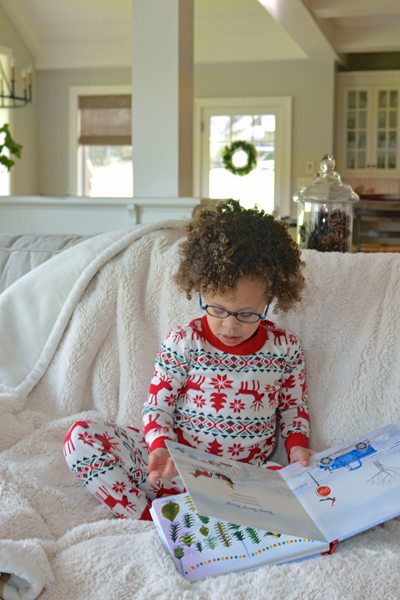 We love reading books with our kids and I couldn’t wait to give them the Little Blue Truck’s Christmas book. Reading Christmas books together is a simple yet fun family Christmas tradition. We purchased a few new books this year to read together, but it doesn’t have to be a new book. It can be an old family favorite or even a holiday book you find at the library. My sister surprised us at our wedding and asked guests to bring a Christmas tree ornament. It was such a personal and special gift idea! Each year when we hang the ornaments on our tree we are reminded of all our family and friends. We’ve also taken up crafting tree ornaments with our kids. On both of their first Christmas’ we made salt dough ornaments with their handprints. 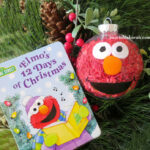 Our daughter also loved making these Sesame Inspired Christmas Balls and she already asked to do it again this year! Growing up my parents taught us to give to others in need. At my dad’s work they had a Christmas tree with tags and on the tag it listed gift ideas for a child in need. I remember doing this every year and going to the toy store to pick out the perfect gift for another boy or girl. I definitely want to do this with our children as we believe it’s so important to teach kindness and generosity to our kids. Last, but certainly not least we make gingerbread houses! 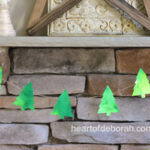 Growing up we always did this on Thanksgiving Day and kept them as decorations until Christmas. We loved picking out the candy and make unique designs on our houses. Our daughter is 3 and I think soon we can start this tradition with her! How do you celebrate Christmas? What are you favorite family Christmas traditions? I’d love to hear your ideas in the comments below! 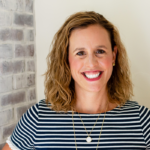 Disclosure: Thank you Hanna Andersson for sponsoring this post. Although I was provided the featured products for free, all opinions expressed are 100% my own. I love matching family outfits – especially when the kids are small 🙂 Growing up I used to coordinate my family for these. You have a beautiful family! We do the Christmas Eve PJs too! We watch It’s A Wonderful Life Christmas Eve before bedtime. It’s something I did as a child and now do with my family. We also look at Christmas Lights on Christmas Eve (something I have also done since I was a kid). The Elf!!! Such a funny movie, my kids love it! We have a tradition of hiding the Elf on the shelf. They get so excited to see what the elf has done overnight.We also all get new Christmas jammies. You do alot of great ones. Thanks for sharing. I’ve always wanted to try this! You guys are too cute! Oh these are super fun traditions! Those PJs!! We are going to start some traditions this year now that my daughter is two. We still have to decide what though. Thank you! So glad I came across this site on pintrest! Love the traditions AND the values you place into your kids with Christ being the center. I plan to try a few with my 2 1/2 year old. Happy holidays to you all! What a great tradition. I wish I had done this when the kids were little. I wonder if hubby and my now college-aged boys would do this? We read the book The Giving Tree and then decorate a tree outside of edible treats for the animals to eat on Christmas Eve. I never thought of reading this book, but such a GREAT idea! 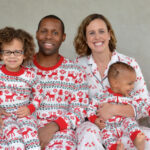 I wish I could get my husband to do the family Christmas pj thing! Your pictures are adorable! I have been getting the kids new Christmas pjs every year. 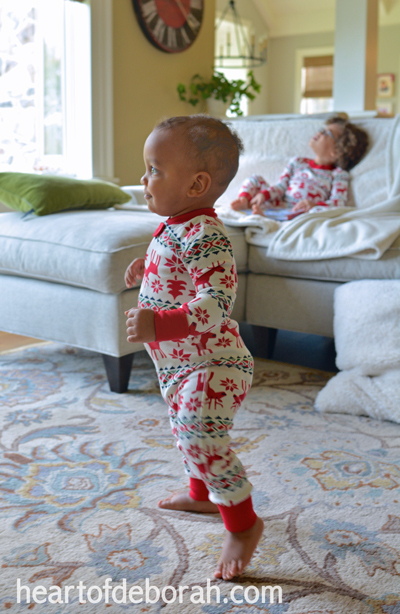 I can’t wait to see them in them, so they get their pjs at the beginning of December!